AoC 2k8 has been unveiled and includes a stellar lineup of authors and the overall theme “Why Don’t They Get It?” As an added twist the 275 (yes, two hundred seventy-five) authors will be cordoned off into 8 sub-sections. I’ve claimed my spot in the “Accidental Marketer” section. Look for me to share how teaching and marketing are two sides to the same coin. And remember the proceeds are going to Variety the Children’s Charity. As an interesting side effect of participating in this project I’m now considered more “popular” by Technorati. It is just like in high school when the freaks and geeks (like me) would gain some social legitimacy by the “cool kids” saying nice things about them. By way of sharing the love and loving the sharing the full list of cool kids authors is below. If you’ve missed it so far head on over to FreshPeel to find out about the rush. 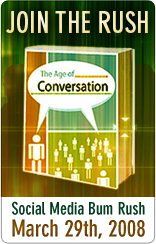 We are rocketing “The Age of Conversation” up the charts at Amazon Saturday March 29, 2008. There are several reasons to do this Amazon rush, the most important of which is to increase exposure for the book because proceeds go to Variety the Children’s Charity. To do my part and increase sales I am offering an “ethical bribe” if you purchase at least one copy Saturday. I still have a few open slots for our latest online course. We just started, which means you can still participate in the live portions of the course. And just to make this weekend fully Conversant: watch for more info about the 2008 volume of The Age of Conversation that I will be co-authoring (with 274 of my “closest friends”!). Here is the low down on several different aspects of becoming a best-selling author that I’ve been observing recently. Joyner presents explicitly as a futurist and explains some of the factors that have lead us to where we are and how volatile the situation is for becoming a best-selling print author. He also extends a challenge that inspired my writing contest video (still sounds strange). While I was not on the list of winners I did manage to get an “honorable mention”. If you aren’t ready to write your own book this might be a baby step towards bestseller status. Paulie Sabol and Ben Mack are sharing their “3 Simple Steps To Never Ending Profits” in the context of Guerrilla Information Marketing – the book with Jay Conrad Levinson that is targeting NYT bestseller list in January 2009. Ignoring the awesome content in the FeBeNe coaching you can take advantage of one of their bonuses to gain authority by association — you will be acknowledged in the book they are taking to NYT bestseller status. And you’ll spend about $30,000 less to do it than Paulie did a few years ago. Either way, go listen to their interview with the original guerrilla marketer JCL. Maybe you want more than the acknowledgment but you don’t want to shoulder the burden of authoring and marketing your bestseller on your own. A collaborative effort can get your book on the Amazon bestseller list like Upping the Downside did last Friday. Does it take the 20 years of experience that were poured into this book? No, but it will take as much resilience as you can muster. Go check out the book to boost that resilience and while you’re doing that watch the process they used to get their bestseller status. So maybe you’re not ready to submit a chapter length essay to a book like Upping the Downside. Think like you’re on the Internet: lots of people contributing a little bit each. The Age of Conversation is exactly that. Drew and Gavin collected one page from each of a hundred authors and created AoC. The interesting twist is that the proceeds are all going to Variety the Children’s Charity. And in the spirit of Conversation there is a “social media bum rush” planned to push AoC into bestseller status on March 29 (like Upping the Downside did on pi day, March 14). This gives you a chance to observe in real time the effects of concentrated effort since you’ll be on Amazon buying a copy of the book on March 29 anyway. If you are not among the 275 authors involved in this year’s AoC volume you can still live vicariously through me. I will keep you abreast of what is happening as Gavin and Drew draw together AoC2k8. And you can bet your buttons I’ll be putting to good use all of what I’m learning from MJ (Mark Joyner), MJ (Mike Jay) and this month’s AoC bum rush in order to push AoC2k8 as high up the charts as I can. And that is truly win-win-win — I (and 274 others) become bestseller, you get great content on “Why Don’t People Get It?”, and the kids get the proceeds! What was keeping you from attaining goals like being a bestselling author?